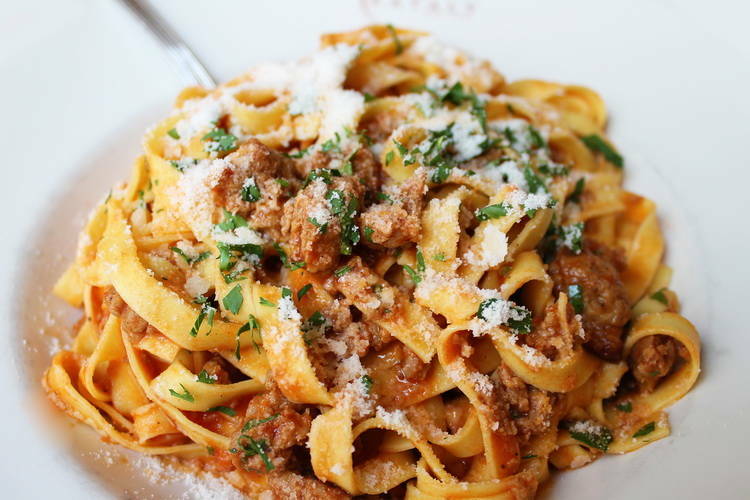 Ragù served over silken egg tagliatelle is one of the signature dishes of Bologna, the food-loving capital city of Emilia-Romagna. In fact, this rich, meaty tomato ragù is so closely associated with Bologna that any dish described as Bolognese will be cloaked in it. In our recipe, we have given you two options: make your own pasta and ragù following the traditional steps, which typically takes about two hours, or use authentic Emilia-Romagna products to create an authentic dish in half an hour. However you decide to go, we are sure the dish will transport you to the terracotta rooftops of Bologna with each bite. In a large skillet, heat the garlic in a drizzle of extra virgin olive oil. When it becomes fragrant, remove and discard. Add the ragù, and heat over medium until simmering. In a heavy Dutch oven or large heavy-bottomed pot over medium heat, melt the butter with the olive oil. Add the onion, and cook, stirring frequently, until the onion is translucent, about 5 minutes. Add the carrot, celery, and garlic, and cook, stirring frequently, until softened and fragrant, about 2 minutes more. Add the wine, and increase the heat to medium. Cook, stirring occasionally, until the wine has evaporated, about 6 minutes. Decrease the heat to low, add the tomato paste, stir to combine, and cook, stirring frequently, for 20 minutes. Season to taste with salt and pepper. Add the stock and adjust the heat if necessary to reach a gentle simmer. Simmer until the stock has reduced but the sauce is still moist, about 45 minutes longer. Taste the sauce, adjust the seasoning if necessary, and remove from the heat. Bring a large pot of water to a boil for the pasta. When the water is boiling, salt it with coarse salt and add the pasta. Cook a few minutes less than package instructions if dry or until the pasta rises to the surface if fresh. When the pasta is cooked, drain it in a colander, preserving a small amount of the cooking water. Transfer immediately to the saucepan, and toss vigorously to combine and allow the pasta to cook a final minute in the sauce. If needed, add a small amount of the cooking water, to loosen the sauce. Serve immediately with the grated cheese on the side, and dream of Bologna.